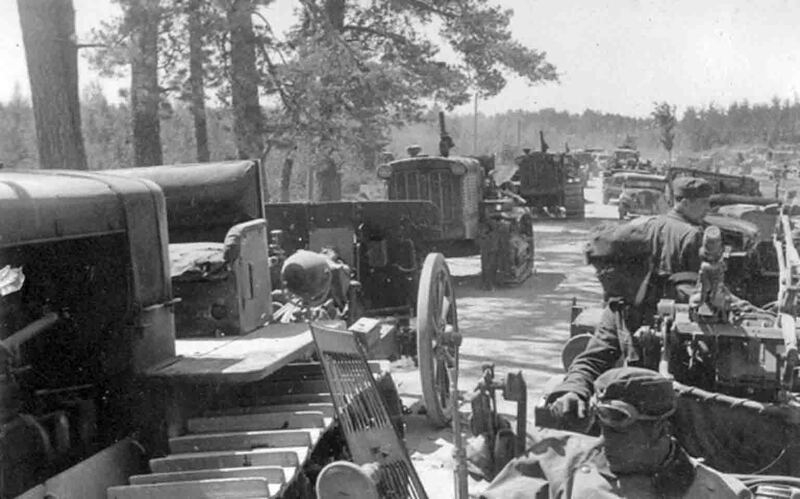 The German military convoy passes by the broken and abandoned Soviet artillery park. In the foreground is a tractor C-65 with a French mounted 105 mm Schneider howitzer model 1934 (Canon de 105mm C Mle1934 Schneider). 70 such guns were purchased by the army of Lithuania in 1937. After Lithuania entered the USSR in 1940, these guns were in service with the 29th RKKA infantry corps, established on the basis of the former Lithuanian army.